A substance applied to internal wall surfaces. Usually based on Portland cement, gypsum plaster of lime putty mixed with sand. Plaster gives jointless, hygienic, easily decorated and usually smooth surface on often uneven background. The face finish to the jointing of a brick wall. The bedding mortar in the joints of a brick wall are cut back to a depth of about 19mm. The pointing replaced the bedding mortar and is more durable and decorative with various types of finishing possible to the surface of the pointing (eg flush, recessed, struck, bucket handle). Also the term pointing can apply to the filling of the joint filling between ridge or hip tiles. Concrete paving slabs cast before being laid in position. Decorative external paving. A horizontal mean at right angles to main rafters. Provided to support rafters between the ridge and wall plate and usually positioned approximately halfway up their height, which in turn are supported by means of struts. Find>>. A device for heating a room. Radiators are containers which provide large surface area through which hot water from a boiler circulated and conveys heat to the room usually by radiation but sometimes also by convection. A radiator can also be a moveable oil filled electric unit which can be plugged into any room as needed. Reinforcement provided to resist tensile (longitudinal) stress as in lintels, beams, suspended floors etc. Concrete can be ordinary, precast or prestressed. Problems with R.C. can result from poor design and/or construction, overloading and corroding reinforcement. Corrosion caused by concrete cracking, spalling, delamination, carbonation, inadequate concrete cover, etc. Concrete into which steel reinforcing bars or mesh have been set. A substance usually applied to external wall surfaces.Usually of cement and sand or similar mix to provide a surface, for appearance or to make the wall waterproof. Cracked external render should be repaired as progressively this will weather and loose key and allow water to get behind render and lead to saturation of wall which in turn can lead to fungal decay of structural timbers internally. A skirting of render at junction of wall with external pavings.Usually the plinth covers the dpc and therefore where provided it is not possible to identify material used for dpc (damp proof course). A wall provided to support a higher level of ground on one side than the other.A retaining wall is designed to withstand the lateral pressure exerted upon it by the rear of the wall. If cracked, bowing and/or leaning this may indicate inadequate design and the wall may require rebuilding. Walls should be provided with weep holes to prevent the accumulation of ground water behind. A horizontal board forming a ridge. Provided in a double pitched room onto which the upper ends of the rafters of the opposing slope are fixed. Find>>. The dampness which is drawn up from the ground by capillary action through absorbent building materials. Prevented in modern building by providing a d.p.c. or d.p.m. However, these can still break down. In older properties no dpc or dpm may be installed. Rising damp lead to damp brickwork, fungal decay of timbers and perished plaster. Whilst electronic moisture readings can detect dampness in walls the fungal decay of timber may not be apparent superficially and may well be covered by fitted floor coverings and/or heavy furniture. When rising damp noted it is usual to recommend the property be checked throughout for timber defects albeit physical restrictions and vendors reluctance to allow lifting carpets etc. often prevent this. Remedial works including waterproofed replastering should be carried out by a specialist firm under long term and meaningful guarantee. The weatherproofing layer of a roof. On a pitched roof the cladding/covering is usually natural or artificial slate or clay or concrete tiles. (Natural slates shown on drawing). 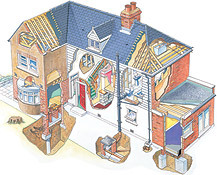 Missing or slipped slates or tiles need to be replaced to maintain roof weatherproofing and whilst isolated replacement is not uncommon this could indicate possible continued regular maintenance in the future and eventual replacement of cladding/covering if this is nearing end of anticipated life expectancy. A term applied to material which spans between roof joists. Provided as base for the roof covering. If roof covering has failed and is leaking then if timber decking this may require replacement as this can distort and also suffer from fungal decay. Metal or other materials may be used for decking. A joist carrying a ceiling below and a flat roof above. Provides structure and fixing for roof decking. Roof joists are not normally designed to carry imposed loads. Where the feet of the rafters spread and overturn the walls of the building. Caused as a result of the weight of the roof covering proving too heavy and/or as a result of roof structure being inadequately tied together. Providing spread is not excessive (ie walls not unstable) usually additional tying and/or strengthening timbers will prevent further spread. Thermostatic control of central heating fixed to wall.Usually provided in entrance hall away from main entrance door and draughts at approximately 1.35m above floor. Automatically operates boiler to keep building at desired temperature. Room temperature can usually be adjusted by means of lock shields valves fitted to the radiators. Compare thermostatic valves. A rolled steel joist. A structural mild steel section in an ‘I’ shape. In residential property would normally be used to support first floor structure where through reception room is formed or to support structure of main walls when opening formed for extension etc. It is essential the RSJ is of sufficient section to take the load imposed upon it and the necessary calculations should be carried out by a structural engineer or chartered building surveyor. Such structural works should also be carried out to approval of the Local Authority and in accordance with building regulations. A large underground tank for the treatment and purification of sewerage. Usually provided for population up to 100 where no mains drainage available. Minor movement of the foundation of a building after it has been loaded by the full weight of the building. Settlement is generally of a limited nature, both in amount and extent, not causing major cracking or distress of structure. Compare Subsidence. A sanitary appliance. Primarily used for culinary and cleaning activities. Usually made of ceramic ware, stainless steel, enamelled cast iron modern kitchen sinks can be made of Asterite (Manufactured by ICI). A dwarf honeycomb wall beneath a raised timber floor. Provided to support raised timber floor structure and allow for ventilation of sub floor structure. A sash window which slides vertically. Usually found in Victorian and Edwardian buildings. Regular maintenance required to ensure window functions adequately. Also, sliding sash prone to sticking in guides, rattling and draughts. The board forming the underside of overhanging eaves.Usually nailed to rafters or bearers. Nowadays the soffit board is provided with regularly spaced grilles to ventilate roof space. Ventilation grilles could prove beneficial if fitted into existing properties’ soffit boards. A vertical, above ground pipe. Provided to convey sewage from sanitary fittings to the ground level where it enters the soil drain. Its head is taken through or left above roof level and left open to ventilate the drain and prevent traps on the fittings being siphoned off. A flat arch in brickwork. Provides a more decorative finish to external head of window or door than a concrete lintel. Bricks can be held in position by adhesion between mortar and the bricks but this method of prone to failure. Some form of additional support to the arch may sometimes be required to prevent bricks slipping. Where the face of brick has eroded due to weathering usually by frost damage.When spalling occurs the hardened water resistant face of the bricks is eroded away and the bricks become highly absorbent. This can cause saturation of the bricks and lead to internal dampness and consequently fungal decay of internally opposite adjacent timbers. Spalled bricks can either be faced with a waterproof render or cut our and replaced. The sinking or caving in of the ground, or the settling down of a structure to a lower level. If the settling down is limited and even in extent, the phenomen is known as settlement and is considered quite normal. It should not lead to large cracking of the structure. If movement is extensive and uneven, leading to cracking of the structure, this is called subsidence and could be caused by insufficient spread of inadequately constructed foundations, inconsistency in the subsoil which was not noticed at the time of pouring the foundations, or some external cause such as leaking drains, dewatering of the subsoil by tree root action or mining activity. A structural engineer or chartered building surveyor should be called in to advise if subsidence is present. Underpinning may be required to prevent subsidence. A drain which only carries surface (or storm) water. Compare Combination drain, Foul drain and Soil drain.